Global style bath rugs from safari and coastal plus cottage chic for your one-of-a-kind escape. Enhance your space with the exotic flair of this Elephant Walk bath rug from Saturday Knight, featuring stylish variegated stripes and a fun fringed borders. Revered by Native Americans, Kokopelli gives your bathroom an authentically Southwestern vibe. A colorful diamond pattern frames the dancing deity on this sand-colored bath rug Add a splash of attention-grabbing style to any bath with the colorful zig-zag stripes of this Sierra cotton bath rug from Bacova. 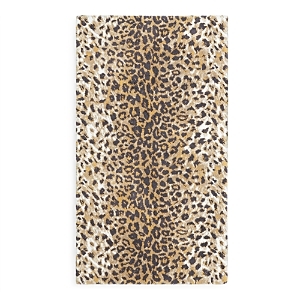 Add a touch of animalistic elegance to your bathroom decor with our two piece giraffe bath rug set. The 2 piece set includes a large and a small rug. 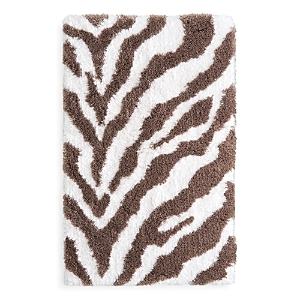 Add a touch of animalistic elegance to your bathroom decor with our two piece giraffe bath rug set. The 2 piece set includes a large and a small rug. Hand-tufted cotton bath rug. 24" x 36". 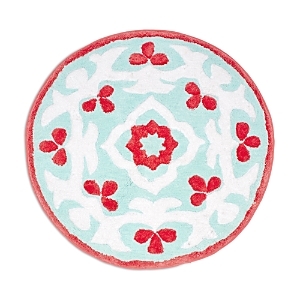 Shaped bath rug is made of plush, tufted cotton. Sculpted cotton bath rug with scattered garland pattern. 24" x 36". Machine wash.
Tufted cotton, viscose. Machine wash John Robshaw loves the traditional rock gardens of Kyoto, where sand is raked to imitate ripples in water. The quiet contemplative afternoons he spent there have inspired the Sazid Bath Rug Shaped bath rug made of plush, tufted cotton. The Avanti Mahal Rug is beautifully tufted in a greyish purple on an ivory ground and finished on both short sides with colorful tassels. Perfect for any kitchen, bathroom, mudroom or entryway. Latex-back for non-slip performance. 27" round. Non-skid pad recommended on slippery surfaces. Cotton. Hand wash. Made in India Block printing is beautifully simple yet can repeat in such interesting, unexpected ways. In our Khoma design we translate this phenomenon into wonderfully detailed woven jacquard towels. Add some enchanting under-the-sea style to your bathroom's decor with the whimsical ocean-inspired motif and refreshing tones of this Atlantis bath collection from Saturday Knight. Evoke the coastal vibes of a beachy, seaside retreat with the Sequin Shells bath rug from Avanti, featuring a tufted pile starfish design against a soothing aqua ground Keep your feet cozy comfortable with the Seashells bath rug from Martha Stewart Collection, featuring the soft touch of cotton, a stylish seashell pattern and a skid-resistant backing for added stability. Bring a touch of old world charm to your bath space with this Antigua bath rug from Avanti. Features beautiful embroidered shells accented with a nautical motif all in soft blue and natural tones for a refreshing presentation Make a nautical statement with the Avanti Seagulls bath collection's splashes of sand, sky and soaring flight that bring serene style to a bath. Bring a stylish breath of fresh air to any bathroom with the beautiful leafy branches featured on this soft bath rug from Charter Club. Classic comfort. Soft, Comforel nylon provides a sweet retreat for your feet in this sumptuously soft Charter Club bath rug. Choose from a lush array of stain resistant hues. Add a pop of color and contemporary style to any bathroom with the bold stripes of this Elite fashion rug from Charter Club. Ipanema handcrafted rectangular rug with scattered sea shell design For the love of the lakeside lifestyle, Avanti created the Lake Words bath collection that refreshes your space with colorful laid-back flair. If the beach is always within reach of your state of mind, you'll want to shore up the inspiring items in Avanti's Beach Words bath accessories collection. The Avanti Destin Rug features an embroidered fan shell, nautilus and coral on a 100% cotton tufted rug. The top and bottom are bordered with beige and white vertical stripes Take your bathing essentials to a whole new level of style and comfort with the super soft cotton and geometric jacquard borders of this Elite tub mat from Charter Club. The Hygro hollow-core yarns are fade-resistant, ultra absorbent and get loftier with each wash. Refresh your bathroom's decor with the seaside charm of this Island View cotton bath rug from Avanti, featuring an embroidered nautical motif rendered in soothing tones.